Soon I felt something alive moving along my leg and up my body to my face, and when I looked down, I saw a very small human being, only 15 centimetres tall . . . 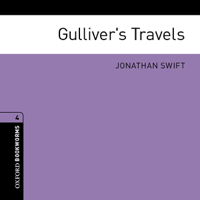 I was so surprised that I gave a great shout.’ But that is only the first of many surprises which Gulliver has on his travels. He visits a land of giants and a flying island, meets ghosts from the past and horses which talk. An Oxford Bookworms Library reader for learners of English, adapted from the Jonathan Swift original by Clare West.